Sound is a physical form of energy that moves as a vibrational transmission through matter. When you make a sound, it creates vibration. Since all matter, including people, objects, and spaces, are made of vibrating energy, the energy of the sound waves affects the energy of the person or object or space so the two begin to vibrate at the same frequency. In energy medicine, this locking into phase facilitates healing. All energy healing, including sound energy, works via a scientific principle called entrainment. A 17th Century Dutch physicist named Christiaan Huygens discovered entrainment when he placed two pendulum clocks near one another on a wall. When the clocks were placed, the pendulums swayed at different rates. However, placed near one another the eventually pendulums locked into phase and swayed together. This is a repeatable scientific phenomenon and serves as the basis for understanding things like sound healing and other forms of energy healing. When a sound is made near an organism or object or in a space that is vibrating at a different rate, the two lock into phase and begin to vibrate at the same frequency. It wasn't too long ago that scientists dismissed the validity of the ancient healing practices of sound therapy, but medical researchers now have the kind of equipment that verifies the effects that sound has on the brain-wave patterns. It's a known fact that during our waking hours and normal daily activities our brains are set in a beta brain-wave pattern. Sound therapy can change that pattern into a restive state of being, known as the alpha state. In some cases, sound alters your brain-wave pattern to a frequency known as theta. It's believed sound or more aptly, its vibration, plays a vital role in the healing process. If you suffer from chronic or acute health issues, sound therapy may be an alternative or addition to your current healthcare regime. You can discover long-lasting effects such as an increased awareness, memory improvement, reduced pain or symptoms, clarity of thinking, enhanced problem-solving skills, and deeper states of sleep. Likewise, you can use sound to change the energy of spaces and objects to bring about improved flow of chi. There are several schools of sound therapy used for healing purposes based on the vibrational energy of sound. Sound and light therapy healers work with these sound vibrations as well as light frequencies to transmit the energy with their hands. The healer manipulates the energies and applies to your energy fields. When these energy fields become unbalanced, the displaced energy often creates disease (dis-ease) within the physical body. Sound healers also work with various types of sound ranging from the human voice to specialized instruments that change vibration and help increase underactive energy, reduce overactive energy, or clear blocked energy so it can flow freely throughout the body's energy centers (chakras) and channels (meridians). The same kind of displaced, disturbed or interrupted energy in your home can set up an unhealthy living environment that draws more unbalanced energy into your home. Chi energy is the life-force of all energies, and feng shui addresses healing the energy fields of your home, the same way a healer would your body. And just as you can with your body, you can use sound to change the vibration and allow stagnant energy to move more freely. In fact, a common and quick feng shui sound practice to move stagnant chi from places in your home where it is stuck is to clap your hands in that location, a use of sound to activate energy. Sound practitioners use a variety of sound healing tools to bring about desired changes in the energy of spaces, living beings, and objects. 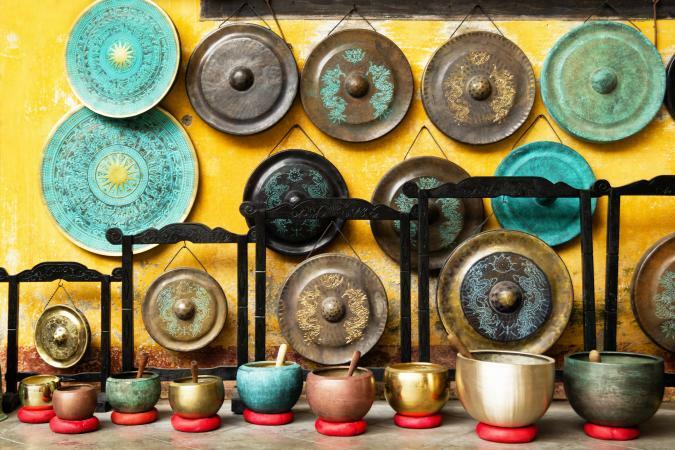 Tools range from simple, such as the human voice (such as chanting mantras or singing) or the clapping of hands, to more complex, such as Himalayan singing bowls, crystal singing bowls, tuning forks, and indigenous instruments. In Tibetan Buddhism, the vibrational sound of OM is sung in a specific pattern of rhythms. This vibration manifests into an energy of perfection and is captured in the sound frequency. The vibrational sound of OM matches the vibration of the brainwaves that control your nervous system. When you recreate the perfect OM sound within your body, the sound wave ripples through you to achieve the perfection of balance on a cellular level. Tibetan monks use sound to retrain their brains in combination with another practice known as meditation. Chanting while in a meditative state, they're able to change their brain-wave patterns. These monks actually chant three notes simultaneously in the rendition of OM. This chord, Tantric sound, is known as the "One Voice Chord" because one individual is able to sing all three notes at once. The significance of singing a chord, specifically the OM chord, is because of its harmonic frequency. This frequency unites all who are participating in its creation. It's believed to be the ultimate healing and spiritual frequency when allowed to vibrate through the physical body. Some monks engage in multiphonnic chanting, which creates harmonics and overtones of different vibrational frequencies. The tone is captured and held within the throat and turned over in the mouth. This is called tuning and is a technique a singer uses to create several pitches at the same time. The sounds are set-up in a continuous vibration that is low and high pitches. These are the sound equivalents of yin and yang energy; the marrying of female and male sounds. Some capable singers can create as many as six pitches simultaneously. Music and other sounds can aid meditation to help create a peaceful state of existence. You can use sound in the places where you live, work, and play to facilitate the flow of chi or create spaces with specific intent such as relaxation, meditation, revived energy, focus, concentration, better sleep, and more. This allows you to attune the energy of spaces to meet specific needs at different times. Like any chi energy, sound has yin and yang principles. Sound can energize your home and surroundings. Adding positive sound vibrations to your feng shui design can optimize or reduce yin and yang energies in your home. Sound waves can be amplified by the kind of materials it strikes and bounces off. The melodic sound of a water fountain can be accentuated by metal objects surrounding it. In feng shui elements, metal draws water, so you'll be drawing more of that element to the area. Just be sure you need to attract more water before adding the elements. You can add other design elements to your home in the form of a sound system, wind chimes, playing musical instruments, drumming, ringing bells, or singing to enhance your home's sound energy. Using sound is a powerful tool to bring healing energy to your body and the spaces you inhabit.